"Warnings are starting to flash all over," Money Morning Capital Wave Strategist Shah Gilani says. "The predominant sentiment these days is uncertainty. The markets are nervous. Very nervous." 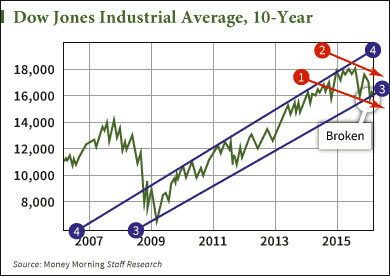 This 10-year chart of the Dow Jones Industrial Average shows how strong the bull market up-trend (3 and 4) has been since 2009. "But, after coming down and touching the up-trending channel's lower support channel line (3) in August 2015 – and then not being able to move much higher – the index just broke below its major up-trending support channel marker," Gilani explains. "That's a dire warning," he adds. "And worse, a new down-trending channel may become the major channel." Global stock markets have been extremely volatile in 2016. Worries of a slowdown in China, plunging oil prices, and negative interest rates pushed markets into a bear market earlier this month. The MSCI All- Country World Index, a broad benchmark of global stocks, slipped into a bear market on Feb. 11 when it closed 20% below its April 2015 high. That also had investors worrying about a potential stock market crash. U.S. corporate earnings have also been soft. With 87% of the S&P 500 reporting, Q4 earnings reflect an average decline of 3.6%, according to FactSet. If that pace holds, profits for the benchmark will have fallen for three straight quarters for the first time since 2009. And the current quarter looks even worse. FactSet projects earnings will decline 6.9% in Q1 2016. That's down sharply from growth of 4.8% forecast in September and 15.1% in April 2015. "Fortunately you don't need a crystal ball to know where stocks are headed," Gilani said. "That's because sometimes markets give clear signals about what they're doing – and where they're going." Gilani adds that recent rallies from oversold levels are not signs of a rebound. "These kinds of rallies, big pops higher in what I see as a bear market, are dangerous," Gilani shares. "They can be the ultimate bear trap and ruin investors. And that means these are trading markets, not solid investing markets." Playing bounces is okay, Gilani says, as long as you use tight stops. And don't kick yourself if you missed out on the last rally, or even if you miss the next. "There will be plenty of time to get in and ride the next Great Bull Market when it arrives," Gilani says. Gentile points out these types of moves every single week. Investors can get looped in here and find out the method behind his 100% gain. Another way to profit during a stock market crash is with an inverse exchange-traded fund (ETF). These are designed to gain while markets fall. Gilani likes three of these ETFs. Each one is designed to track the inverse performance of a specific index, either the Dow, S&P 500, or Nasdaq. These ETFs will rise as a bear market drags down the broader indexes. Gilani also has a specific short-term move for when he believes markets will fall hard that day or the next. You can get access to all four of his picks here. Finally, for long-term investors looking to hold stocks for five or 10 years, Money Morning Chief Investment Strategist Keith Fitz-Gerald says to focus on companies that provide products the world cannot live without. Stocks like these are investments. They may be down now, but you're going to be holding them through several market cycles. Fitz-Gerald reminds investors that are mulling a move to the sidelines to be selective, but be in the game.